Being comprehensible even for novices, this functional software tool will help you out in restoring files of any type that were lost due to accidental deletion, mistaken storage formatting, severe file system damage caused by a virus attack and numerous other issues. The program works with a huge diversity of internal and external storage media formatted with various file systems, both physical and virtual ones. Install this cross-platform application on Windows, macOS or Linux and it will effectively deal with your logical data loss case, no matter how difficult it is. 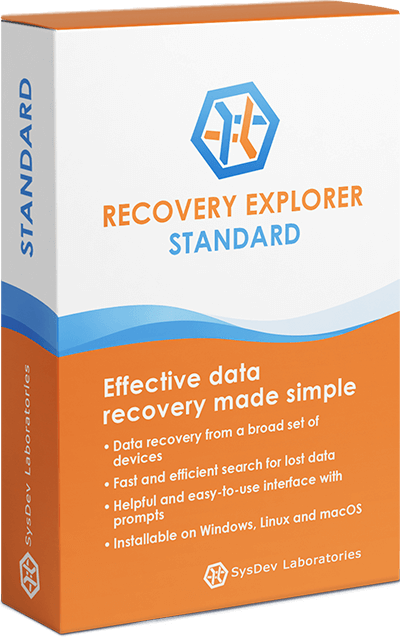 Recovery Explorer Standard is aimed at providing the general public with lucid and exceptionally convenient to use means for professional-quality data recovery. If you’re an expert in this field, you might be interested in a more specialist-oriented software – UFS Explorer Standard Recovery. Learn about the difference between these products and choose the one which perfectly meets your individual data recovery needs. MicroSDs, MiniSDs, MMCs, Memory Sticks, etc.